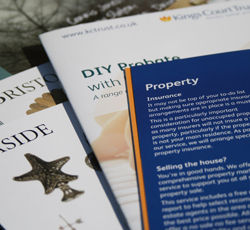 Why not consider a brochure to promote your business or event. Avon Printing Services can produce high-quality, full colour brochures allowing you to promote your business or event professionally and attractively. Whether you are looking to produce a standard A4 or A5 format or prefer a square or more unique size, we are ready to help. We’ll share our print knowledge and advise how you can get the best results from your budget by helping you decide the best size, which material will achieve the best results and what method of finishing will suit your brochure. After all it’s your brochure and the choice should be yours. Brochure Printing, A4 4pp Cover printed four colours both sides on to 300gsm Silk with 8pp Text section printed in four colours throughout on to 170gsm Silk. Score, fold and saddle stitch. Trim, box & label…….750 copies.